Oldest has been having nightmares lately. He woke up in the night crying and afraid and the first thing this morning he tells me is that a wolf was after him in his dream (but he 'was very brave'). Later, he asks me if we live in a brick house. 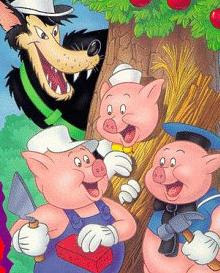 Oh my poor, sweet little boy who's afraid of the wolf from the Three Little Pigs. Fairy tales are quite frightening, aren't they? Luckily, we do live in a brick house. They definitely can! Poor Elliot. Awww! Poor baby! I hope his nightmares go away soon. My little boy is having nightmares too. He is scared of bears at the moment. He wants us to keep his bedroom door shut so the bears can't get in. Poor little boys. I hope they get over it soon.